Ammamma was a grand old lady who ruled the roost where ever she stayed. 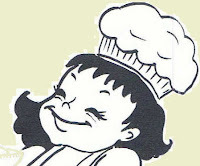 She stayed with all her four offsprings in turns, and was very meticulous in getting their favourite dishes perfectly cooked at every meal time. Her grand daughter ( who is my sister - in -law) fondly remembered Ammamma's muzhu mambazha morkuzhambu ( whole ripe mango in curd gravy) , and about her eagerness to serve at least one muzhu mambazham ( whole mango fruit) to each family member and also to one or two guests who always thronged the house during meal time. In that effort she would always end up with a huge trough of morkuzhambu ( curd gravy) accommodating that many number of mangoes! 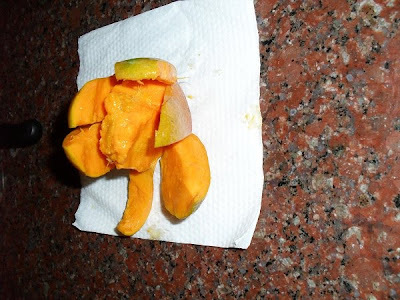 I tried out the dish with only two ripe mangoes since I did not want any left over morkuzhambu. 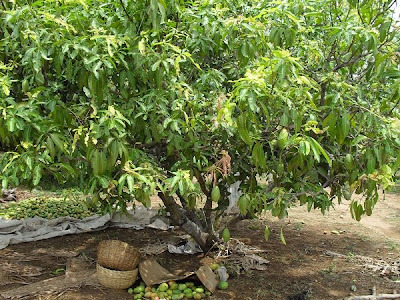 A particular variety of mango called "SINDURA" which we purchased near Dharmapuri was appropriate for my experiment. It was small, firm and without fibres. 1. 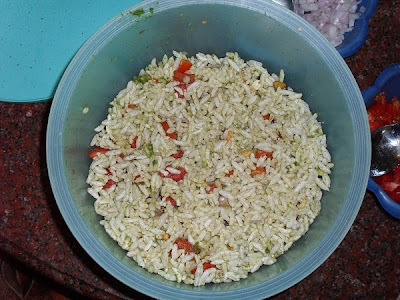 Soak rice and grind with coconut gratings and green chillies into a fine paste. 2. Wash and slit the ripe mangoes keeping them intact at the base. 3. 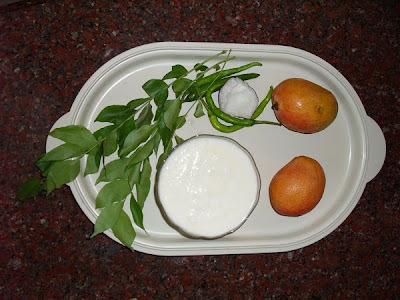 Add a glass of water to half of the ground paste, immerse the slit mangoes in it and boil for ten minutes. 4. Blend the thick curd and the second portion of the coconut and green chilly paste smoothly with salt, and mix it into the gravy. 5. Let the mor kuzhambu be on low flame till it starts to thicken. 6. Switch off flame just before it starts to boil. 7. Heat coconut oil and add mustard seeds to crackle and then add the curry leaves, and pour the seasoning into the morkuzhambu. Enjoy the muzhu mambazha morkuzhambu with steaming hot rice and a spicy masala papad. It is a wonder that mangoes, both raw and ripe can be cooked into both sweet and spicy mouth watering dishes. 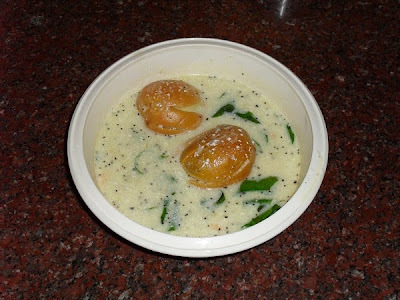 Here is a dish which I prepared using ripe mangoes ( mavina hannu - Kannada ) and mustard seeds (sasivae - Kannada). The dish tastes good with firm ripe and pulpy mangoes with out fibers. 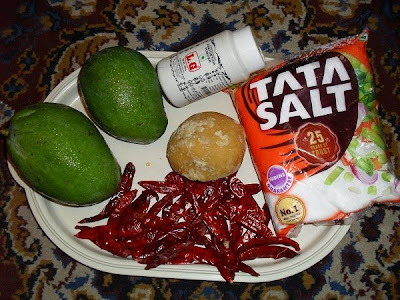 The sweet, spicy and pungent dish was a great hit at home. 1. Dry roast mustard seeds till they crackle and give out a good aroma. 2. Grind fresh coconut gratings with roasted mustard seeds, pepper, cumin seeds, chilly powder, soaked tamarind, jaggery and asafoetida into a fine paste. 3. Heat oil in a pan and season with mustard seeds. 4. When the mustard seeds crackle add the ripe mango cubes and saute for two minutes without mashing them. 5. Add the ground paste , mango juice and salt. 6. Let the Sasivae boil ( add a cup of water if needed) until all the flavours blend and reaches a gravy like consistency. Enjoy the lip smacking dish to start a meal, through the meal and even after finishing your meal! The highway via Dharmapuri and Salem split smoothly through the beautiful tender green mango topes (Groves), with rough and sturdy hillocks standing guard in the background. 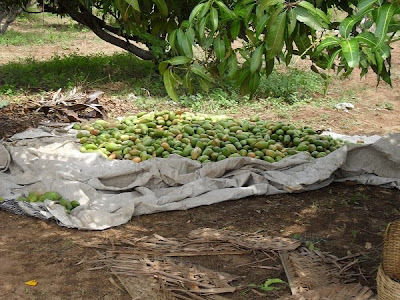 Green, firm and juicy mangoes looking like emerald pendants weighed down the branches of the short mango trees. The already harvested ones lay in mounds at the foot of each tree. 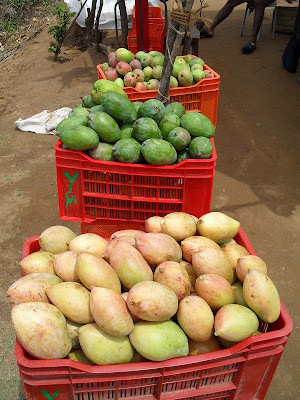 Ripe and raw mangoes of all hues and sizes were stacked up in shacks skirting the high way.The fragrance and the colour of the king of fruits attracted each and every passing vehicle which compulsively stopped by, for a happy bargain. 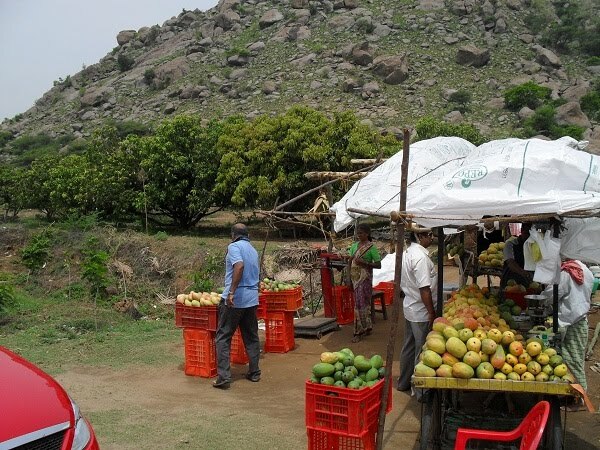 The sight of the king of fruits lead us to exchange various mango recipes and my sambandi and I chatted and chatted only mangoes till we reached our destination! Since we had bought a cart load of mangoes on our return trip, I started preparing the mango dishes one by one. CHAMANDI which I learnt from my Sambandi was the first one to be dished out! 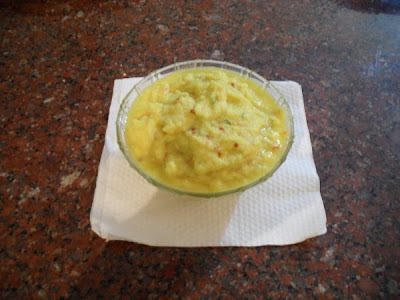 Chamandi is a chutney or a dip or you can even call it a pesto, prepared with raw mangoes and raw spices. It involves no cooking. 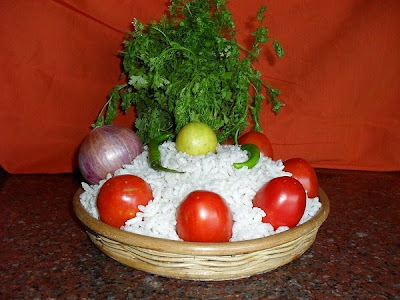 A side dish with a tang, it goes very well with rice and koottu or rice and morkuzhambu , curd rice, chapatis and dosais. 1. Peel and grate the mango . 2. Grind all ingredients without coconut oil into a slightly coarse paste. 3. Add coconut oil and run the mixer just to blend. 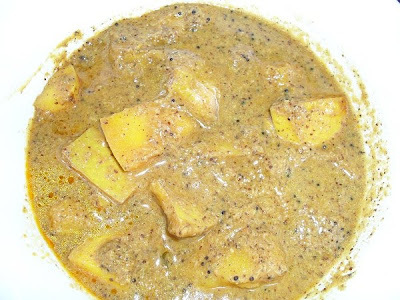 Enjoy the mixed taste of Chamandi with a mixed flavour of mango and coconut oil, with steaming hot rice.
" Taeeenga maaanga battani sundal!" As I write this , the voice of the sundal vendor resonates in my ears. We always looked forward to visit Madras ( Chennai) during our holidays to enjoy our grandmother's pampering and also to visit the clean and serene Marina Beach.We were greatly awed by the lashing waves and the far away ships which dotted the vast horizon. We built sand castles, combed the beach for sea shells and stood in the waves for a long time expecting the waves to throw out a great treasure at our feet! Only the sundal vendor's sing song voice drew us towards the dry sands. Grandmother bought us the yummy 'beach snack' which we kept pecking from the paper cone packets till we reached home. The unique taste of the sundal made up for the treasure we never found! When my grand children heard the story,they were very eager to taste the snack. Hence I prepared it for them and also tried to imitate the sundal vandor's sing song voice while serving! The excited children relished the sundal but did miss the great Marina Beach. 1. Soak the peas over night, throw away the water the next day and pressure cook with out adding water. 2. Wash the mango ( preferably the variety called "Kili mookku" or "Gini mooti" which is not too sour), cut into long strips and mince evenly into tiny pieces. 3. Slide a sharp knife in between the shell and the kernel of the coconut , loosen it and bring it out of the shell. Cut the coconut into thin strips and then into tiny pieces similar to the mango pieces. 4. Mince green chillies and chop the coriander leaves. 5. Heat the oil in a kadai and add mustard seeds. 6. When it splutters add the black gram dal and roast till it turns golden in colour. 7. Add chopped green chillies, asafoetida and turmeric powder. 8. Add mango pieces and saute for two minute to bring out the mango flavour. 9. Add the cooked peas and salt and blend well without mashing the peas. 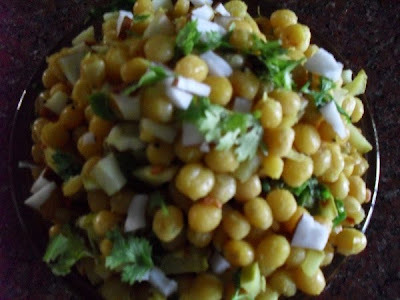 10.Turn the flame off and then add the coconut pieces and coriander leaves. Enjoy the flavoursome crunch of the juicy mango and the milky coconut as you munch away the softly cooked peas. 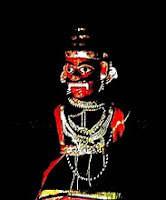 The battalion of children in our household are greatly attached to my brother who is a virtual Santa Claus to all of them.They loved to accompany him on long drives around Mysore city, and drooled over the churmuri he bought for them from a cart near the 'Kotae Anjaneya' temple. Some times they invaded the kitchen and helped my brother who indulgently prepared their favourite snacks or cool drinks with a cart man's expertise! Pani puri, Churmuri, mini pizzas, iced lemon tea, lassi, badam milk and many other snacks rolled out of our kitchen amidst a lot of clamour, turning the entire dining hall into a mini fare. 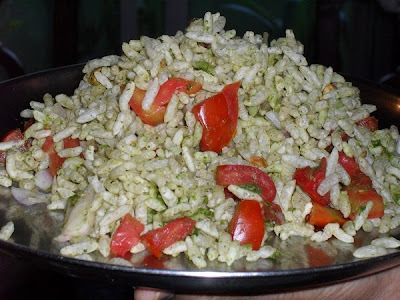 I learnt to make Churmuri from my brother on one such occassion. 1. Mince onion and tomatoes finely and keep separately. 2. 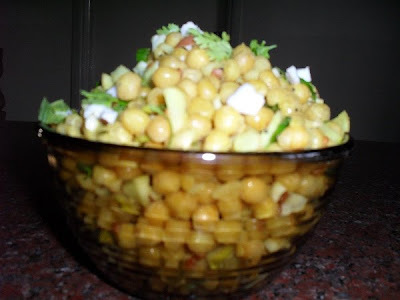 Grind coriander leaves, green chillies , salt and sugar into a smooth paste, mix in the juice of lime and keep aside. 3. 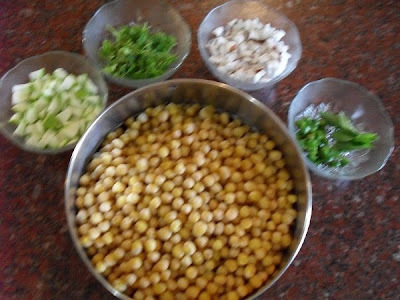 Just before serving mix the chopped vegetables, ground coriander paste, puffed rice and roasted peanuts in a vessel with a lid. 4. Add the coconut oil for flavour, cover with the lid and shake the vessel vigourously to blend all ingredients. Enjoy your Churmuri immediately before it becomes soggy. 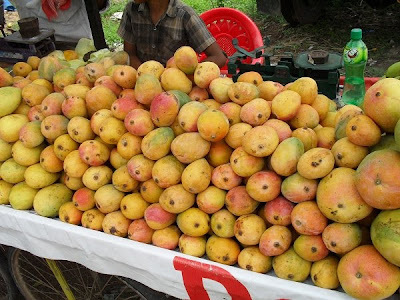 Minced mangoes can be added during mango season. Carrot shreds can also be addded for variation.